I made this for a friend as a house-warming gift. It's made of dark green hessian and stripey upholstery fabric. It has since survived the attentions of a hyperactive puppy, many builders and decorators, and is still keeping out the draught. 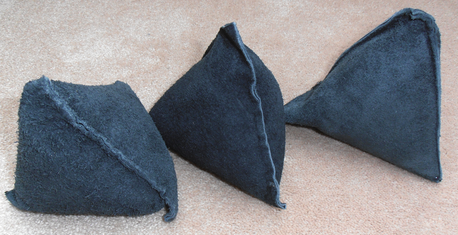 These doorstops are made of reclaimed suede and have four triangular sides. Does that makes them tetrahedrons?